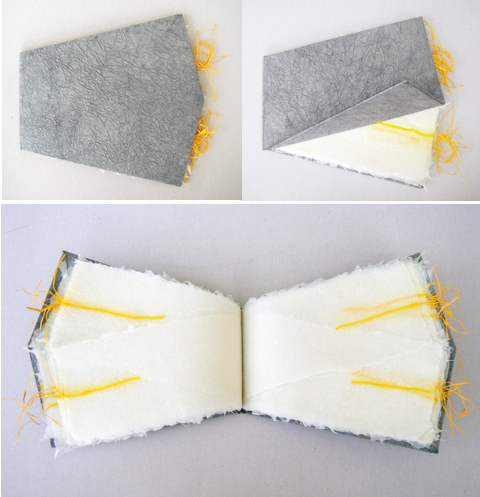 A recent foray into papermaking and bookbinding: a fine, handmade book with an elegant gray cover and handmade abaca paper incorporating Shifu-type paper yarn. 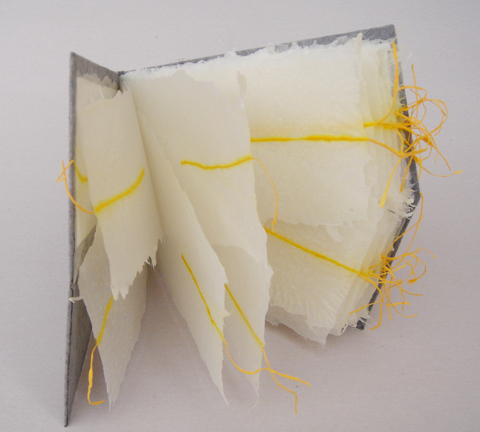 A handmade, yellow Shifu paper yarn made of handmade, Korean hanji paper lies between two superthin and tranlucent layers of abaca paper (yes, lots of “handmade” in this sentence!). The sheets of paper were rather oblong in size and we felt it would be nice not to make a regular, rectangular book but a very special size. Therefore the long sheets were folded in an angle and a “flap” was incorporated into the book cover to play with this special format. 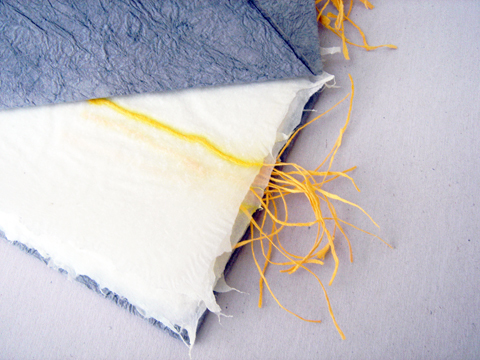 The gray paper of the cover is a handmade Japanese washi paper brought back from a trip to Amsterdam. Another stack of special handmade papers with incoporated paper yarn is waiting to be made into a book at the moment – we’ll see how it will turn out!